“Phantom 1” interior was designed by famous Nuvolari-Lenard, it’s elegant design combines with extraordinary comfort and speed. One of the greatest features in this boat is The hull design and propulsion system by Victory Design. 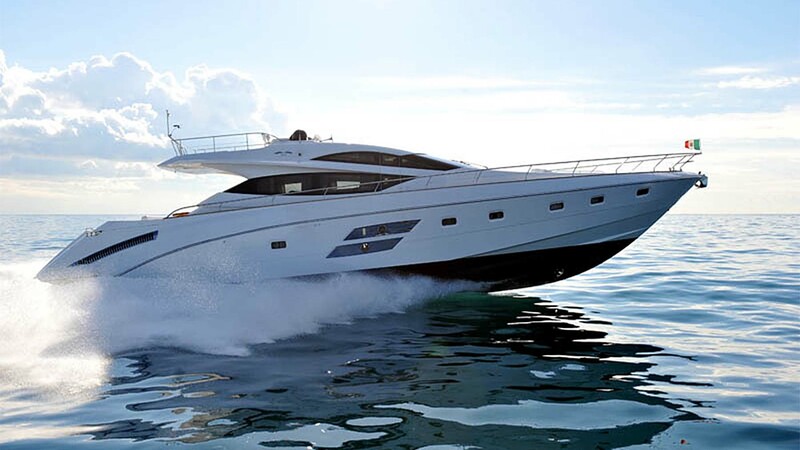 The care with which the boat was built using dynamometric cells to verify the correct weight distribution, have led to a perfect trim of the yacht in any condition. Sarnico Grande cruises at the economy speed of 20 knots for at least 430 mile range and reach a top performance at 42 knots. These excellent results were obtained using a lower power than the one normally used by other yachts of the same type and dimension. Phantom 1 has the “command bridges helm station on the flybridge, accessible via a retractable carbon ladder. It allows you to enjoy all the excitement of performance and to manoeuvre more easily by controlling the spaces from above. It features 4 cabins and sleeps 8 guests. The owner’s cabin is spread over the entire beam, is illuminated by panoramic windows and includes a large bathroom and a dressing room, while another room, free for any use, is close to the cabin. There is a high level of comfort and luxury in the three guest cabins which have bathroom “en suite” and are filled with natural light that comes both from the portholes and the skylights through the bridge. Always owned by the same family, very well maintained by the captain and professional crew. Had an extensive refit in 2017.